The name sounds like a bird's paradise, doesn't it? Birdsville is well-known for its dust storms, the scorching heat in summer, and its loneliness. 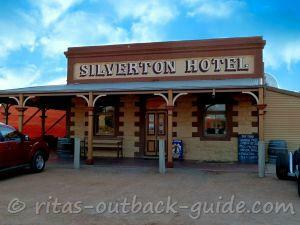 But the tiny town is also a paradise for bird & nature lovers and those who like unique Outback scenery. 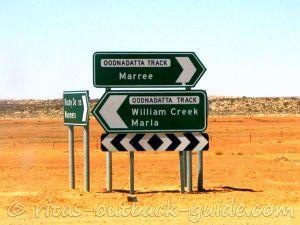 You think you finally arrive at a populated area once you've managed the Birdsville Track from Marree? Far from it! Whichever route you took to get here, you've come a long way. Believe me, you're still in the middle of nowhere. And it sure takes some driving to get to the next major town. 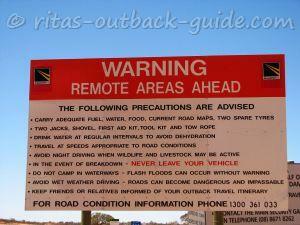 But hey, this is Outback Australia! You'll love it. Relax and enjoy true country hospitality in this historic town. Birdsville has a hot climate. Summers will be very hot, with average maximum temperature over 30°C from October to April. The highest temperature was 49.5°C. Winter has warm days and cool nights. Rain is unpredictable, the amount varies from year to year, but heavy rains usually happen in summer. Dust storms can occur in periods of strong wind, especially in spring. April to October is the best time to visit. This doesn't look like you're in the desert, does it? It is such a wonderful country out there, for painting and photography, for everyone who enjoys nature. 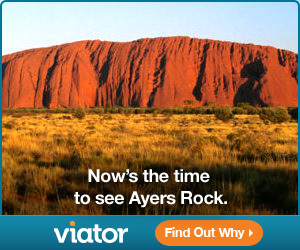 All you need is a little bit time, and the Outback rewards you with spectacular sunsets, wildlife and sheer beauty. 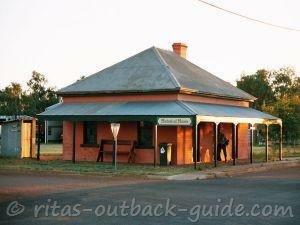 The town is situated at the edge of the Simpson desert in the far southwest of Queensland. 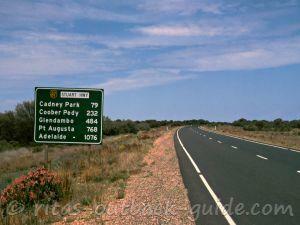 In the early days, it was a toll point for stock crossing, as it is not far from the South Australian border. Birdsville is surrounded by sandy plains, that's were the regular dust storms come from. The region doesn't receive much rain, but when it rains, it pours, and the town can be cut off for a couple of days. Despite the dusty surroundings, the Diamantina River provides the town with a lovely permanent waterhole. 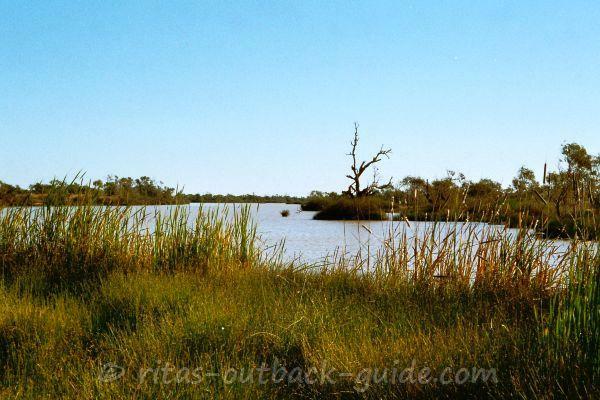 The billabong, right behind the caravan park, truly is a paradise for bird-watching. The rich birdlife gave the little settlement that was once known as Diamantina Crossing its final name. Unfortunately, the billabong is a heaven for mozzies, as well. 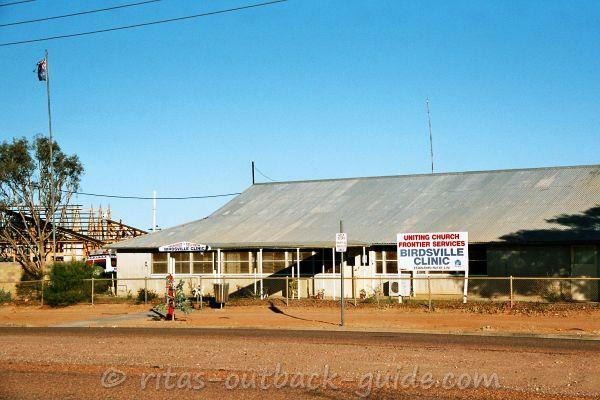 Like many rural settlements, this bush town had its ups and downs. 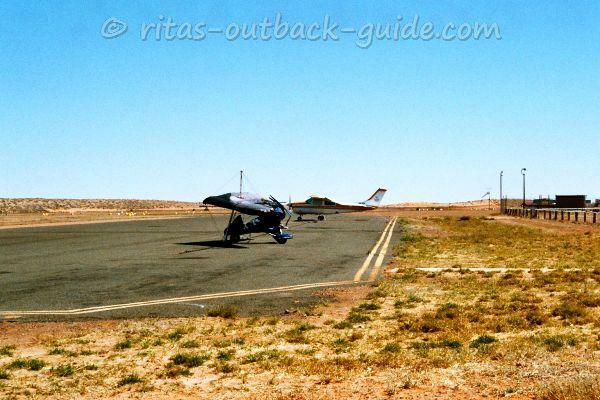 Today Birdsville serves as a "major" centre in the huge Diamantina Shire. Well, it is easy to get the "major" status out here when in fact the entire shire has only two towns of any size, and a population around 300! 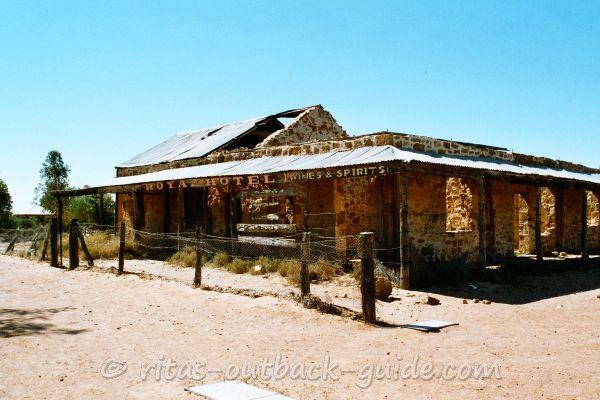 The Royal Hotel ruins - the hotel was built in 1883, and operated as a hotel for 40 years. From 1923 to 1937 the Royal was used as a hospital. The materials to convert it from a hotel to a hospital were brought to town by a camel train of 75 camels. Imagine that! You can't miss the hotel ruins, they are just down the road from the caravan park. 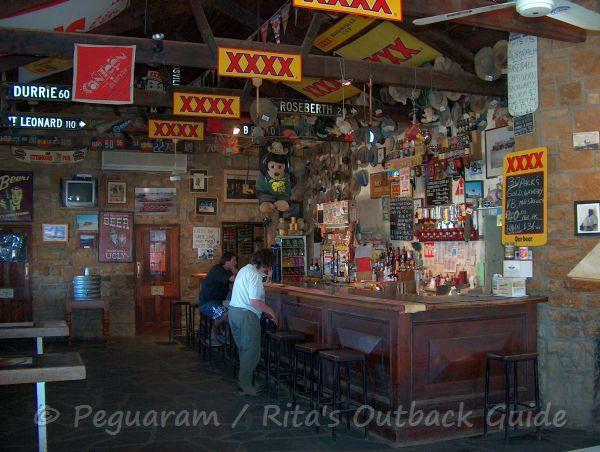 The Birdsville Hotel is Australia's most legendary Outback Pub. Built in 1884, the hotel has a long history of being a place to spin a yarn, experience the Aussie spirit, and get an ice-cold beer. The Aboriginal Story Place - Thutirla Pula - This is an important cultural place on the edge of the town. The "Two boys" dreaming place links Dalhousie Springs (Witjira) across the Simpson Desert with Birdsville (Wirrarri). The story tells how the water wells across the desert were created in ancient times. The Birdsville cemetery is an interesting place with old graves a little outside the town. Are you keen for a sense of adventure? 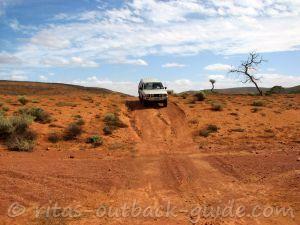 The Big Red Sand Dune, the most famous dune of the Simpson Desert, is just 35 km to the west. It is the first and highest sand dune in the Simpson, and a challenge for 4x4 enthusiasts. Please be aware that you need to be well equipped and experienced if you're going to cross the Simpson Desert, which is only recommended during the winter months. The former AIM hospital at Adelaide St is a heritage-listed building, along with the above mentioned hotels and the courthouse. Visit the display in the old hospital (open daily) and learn about how medical treatment is provided in remote areas. In the above picture, you can see the new hospital being built on the left of the old one. I had to visit the nurse in the hospital on my visit because I travelled with an inside fracture in my shoulder. 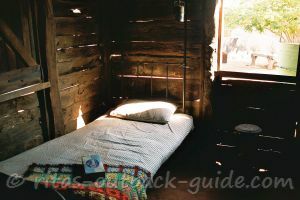 She gave me useful tips to heal well, and avoid complications during my journey through this remote region in Queensland. The town is famous for the annual Birdsville races. The race week is held around the first weekend in September. The races attract thousands of visitors, and everything goes a bit crazy in town. Imagine, 5000 people from all around Australia invade the sleepy little town! If you're around at this time of the year, don't miss the race weekend. 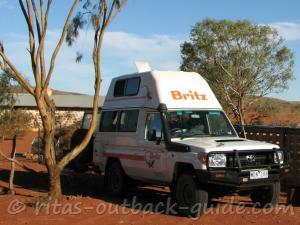 It is an exciting Australian Outback event. The Big Red Bash - the most remote music festival you can think of. The 3-day festival is held every year in July on foot of the big red sand dune, about 35km outside of Birdsville. Like the race event, the big red bash attracts a huge crowd that travels to this remote town for good music, fun and an unique experience. Did you know there is a term "dry flood"? This what is happening to Birdsville right now ( March 2019). The town has received less than 1mm rain in the first two month, so where does the water come from? Devastating rains and floods in Queensland's north and central west earlier this year have killed about 500,000 animals. This floodwater is now moving south through parts of the channel country, feeding mostly the Diamantina River catchment. Station owners in the southwestern part of Queensland are happy that the flood gives the land the much needed moisture back after 7 years of drought. That's Birdsville in the picture below, surrounded by water, in late February 2019. Simply stunning! 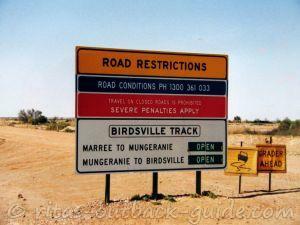 How to get to Birdsville? You can fly in with your own small airplane, or with Rex Airlines from Brisbane or Mount Isa. From the south there is the Birdsville Track from Marree (520 km). 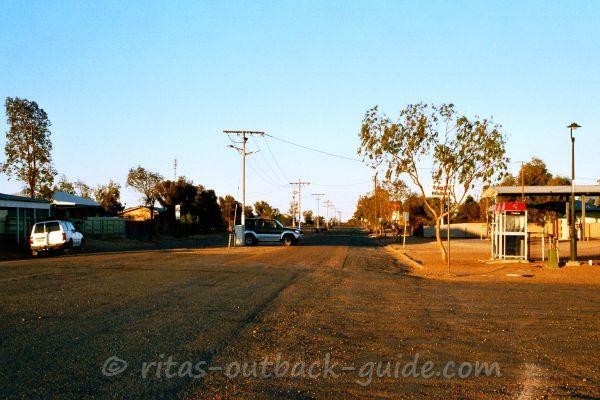 From the east you travel from Windorah along the Birdsville Developmental Road (380 km). This Road is sealed for about 110 km on the Windorah end. From the north you will get to Birdsville along the Eyre Developmental Road from Bedourie and Boulia (380 km). The route has sealed and unsealed sections. 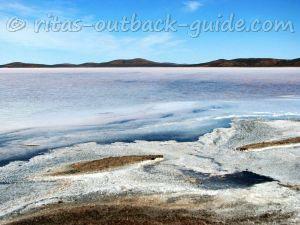 Below you'll find more articles about this stunning region. 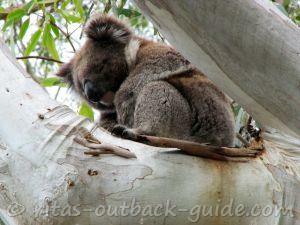 The range of hotels, motels and budget accommodation in Australia abounds. Use the search tool below to let HotelsCombined find you the best deal from several booking platforms.